The biggest stars of movies and television attended the awards’ seasons biggest and most inclusive party last night. The 2017 Golden Globes honored the best and brightest of the big and small screens including many celebs from MediaMine’s Walk of Fame and Reba Merrill collections. The Golden Globe Award winners are selected by the 93 members of the Hollywood Foreign Press Association (HFPA). Each year stars gather for the Globes gala dinner to recognize excellence in domestic and foreign film and television. This year “The Tonight Show’s” Jimmy Fallon served as the host. Gosling wasn’t the only winner that Merrill has interviewed in the past. She’s also conducted sit downs with Best Performance by an Actor In A Television Series Drama prize winner Billy Bob Thornton. 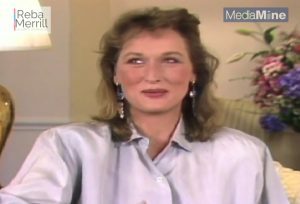 To license footage of Reba Merrill’s interviews with Streep, Thornton and Gosling sign up for the Reba Merrill collection. The website also contains stills from the official Hollywood Walk of Fame star ceremonies for many of the Golden Globe winners and nominees in the Walk of Fame collection including Streep, Jeff Bridges, Nicole Kidman, Winona Ryder, Julia Louis-Dreyfus, Bryan Cranston, Felicity Huffman, Ryan Reynolds, Annette Bening and Billy Bob Thornton.